At the GDC 2019 is going on and one of the most interesting things that happened in the course of the appointment is certainly the announcement of Oculus Rift’s: the new version (produced in partnership with Lenovo) the display from which the whole new wave of VR is started, the output for $ 399 in the course of the spring 2019. It is an update very important, but not a revolution, a deliberate choice on the part of Facebook that has preferred to work up and bring in the shops “the best Rift ever” rather than push on the accelerator and create something technologically revolutionary but also very expensive. The VR search, in short, yet growing in numbers, and to create an ecosystem compelling enough to convince more and more developers to come on board. The idea is that this could be the right time, the product is there, both at the level of specific comfort, so if you are interested to make a leap into virtual reality read on because it might be the right time. 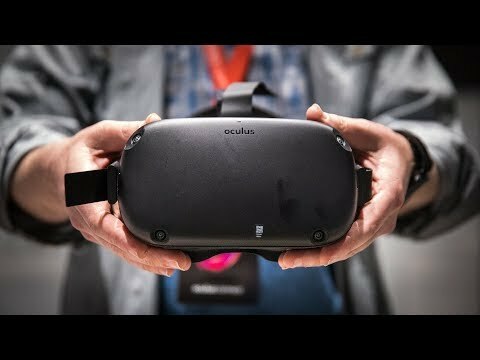 Oculus Rift S, the evolution of the speciesAs it has been improved Oculus Rift S compared to the previous model? Meanwhile, the screens have a higher resolution, hour climb to 1280x1440p for each eye. The new lenses are also designed to produce a sharper image, improvement that will allow you to view the texts and the user interface without the blur, and the small or big problems of the past. Speaking of ergonomics, the Rift’s is the most lightweight, comfortable to wear on and take off thanks to the wheel on the back that allows you to tighten it and stretch it in an instant. Disappear completely, also the cameras to be placed inside the room: now all the necessary sensors to map the environment and allow us to not schiantarci against a table or a chair, are inserted in the device, simplifying the installation process. The press of a single button will also give you a way to use one of the cameras to display on the Rift’s external environment. In this way, not only can you return to reality, but also redefine the so-called Guardian of Space (the boundary space within which we can move before be warned that you are exiting from the security area) that can be drawn to earth with the controller to their individual needs. Move from one room to another, designing the game, edit it, and change from one session to another is, in fact, become a process extremely simple. Those who hoped in the disappearance of the cables , you will be disappointed: there is indeed still a long five meters out from the Oculus Rift to S to enter the PC, a choice which according to Facebook is due to the desire to contain the prices and not having to sacrifice the quality of the experience. The communication of that amount of data without cables would, in fact, or imposed a compression that would have had a negative impact on the image, or the adoption of a hardware is still too expensive. For those who want to play in total freedom all that remains is the Oculus Quest, and his system all in one, sort of a console to the virtual reality. A question of ecosystemWe tried the Oculus Rift to S with some securities, including the interesting Stormlanddi Insomniac Games. As mentioned above, the quality of the experience has grown with the passage of time and, for as still you can’t say that you forgot to wear a visor for virtual reality, the weight distribution on the head, the quality of the materials used and the general quality of the experience of use allow you to dress him up for a long time without becoming tired. The combination of screens and lenses in the revised than in the past the united states with a new generation of titles like the previously mentioned product of Insomniac but also Asgard”s Wrath – are also making a leap forward that is sensitive to the supply of virtual reality, in just a couple of years it’s gone from something exotic and rather limited to a reality able to put on flat gameplay are articulated and graphics not bad. Among other things, all this does not seem to carry an important increase in the minimum specifications required (you spoke with only a slight increase of the CPU) and of course the list of products announced, will be compatible with both the old model with the new one. In short, a leap forward for those arriving now for the first time, without forgetting those who are already a Rift in the sitting room. At the level of the ecosystem Oculus Rift S will keep its store more or less open to all, a marketplace in which each developer will be able to continue to insert his games, regardless of the price, and ambitions. This is in clear contrast to the virtual shop of the Oculus Quest which will be handled entirely in the choice of titles. The warranty, however, is that all games come out for the Quest will also be present for the Rift (S) and finally will be implemented the presence of a system of cross play and cross buy: the players of the two platforms will thus be able to challenge each other and those who happen to have both, they can have access to games on both without additional charges. They look like small details but are actually the demonstration that, after a pioneer start slowly, slowly, the VR signed Facebook is finding its square and becomes more and more coherent and complete. An important step for users but also for developers who may seek to produce the next big success to Beat Saber, now arrived at more than a million copies and placed on the market. Considering that 2020 could be the year of new consoles and then PlayStation VR 2, that we take virtually for granted considering the great success of the first model, we think that the Oculus Rift to S is the intermediate step fundamental in order to understand what will be in the next five years in virtual reality. Like it or not, the VR seems to be here to stay.